Whether it’s fashion or fast cars, people are keen on staying up with the latest trends. 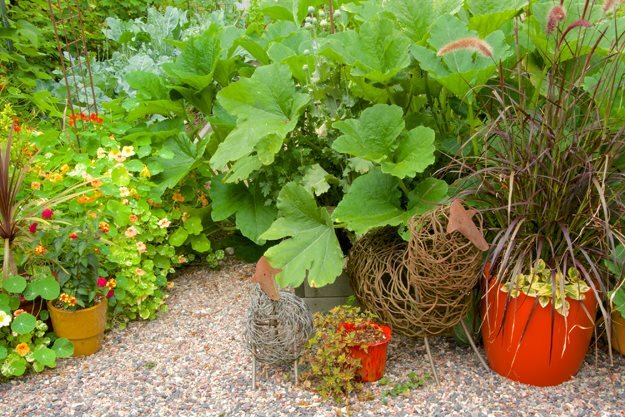 From hot tubs to hellebores, many gardening crazes have come and gone, while some remain a perennial part of the horticultural landscape. Here are the hottest predictions for 2015 from some of the nation’s top gardening professionals. “I attend consumer and trade shows throughout the year, and I love seeing what's new and exciting. “Edible gardening is becoming a bigger part of outdoor living spaces. I saw a patio table at a trade show with a built-in pocket at the center planted with lettuce and herbs. You can sit down for dinner and harvest your own fresh salad right off the table! “Miniature fruit bushes are really catching on, with varieties like the BrazelBerries® series of blueberries and raspberries that thrive in containers. For the urban gardener, it’s a great way to have something fresh to eat right at your back door. “Foodscaping is becoming extremely popular, with edible varieties being incorporated into traditional landscapes rather than planted in separate kitchen plots. I see foundation shrubs such as Nandina (heavenly bamboo) being substituted with small blueberry bushes. “A younger generation of avid gardeners is helping to spur the foodscaping movement. With an increased awareness of industrial farming practices, these young adults are more conscious of where their food comes from. 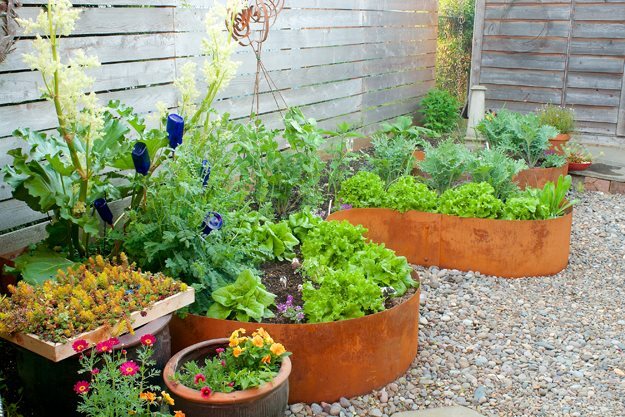 Growing fresh food at home is becoming part of an everyday lifestyle. “We have a different take on trends here in the desert Southwest than most areas of the country, as our terrain and climate are vastly different. 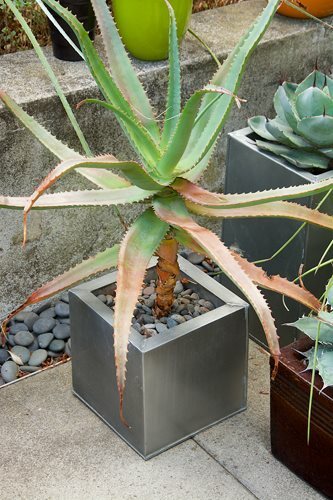 “I’m seeing more agaves and other succulents being planted as single specimens in decorative containers. Cactus collections are showcased in handmade pots by local craftsmen. This treatment highlights the plants, bringing them to the forefront as artistic focal points rather than as background elements in the landscape. “Many of the South African bulbs perform well in our cooler growing seasons of fall and winter. Gardeners are combining them with succulents for a more layered effect. “As lot sizes continue to shrink, there is more demand than ever to make the best use of a smaller space. Homeowners have higher expectations; they want their yards to serve multiple purposes where they can entertain, relax, fix a meal and accommodate pets and children. 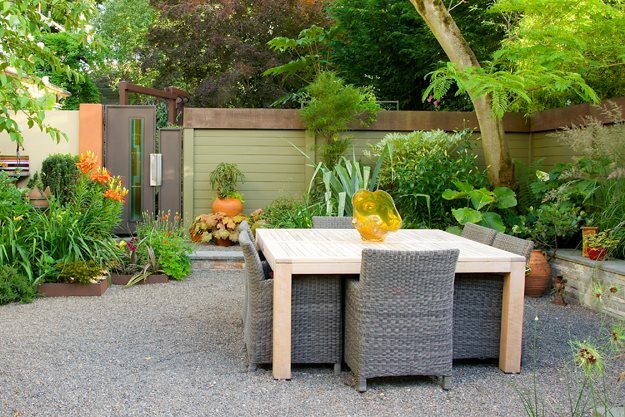 Designing a small yard is more challenging, but also more rewarding when it all comes together. “Covered pergolas are more popular than ever. People want to spend more time in their yards and a structure, no matter how big or small, offers a place out of the elements that extends the outdoor season. “Consumers are feeling better about the economy, so they are more willing to commit to home and garden improvement projects. With people being busier than ever, there is greater appreciation for relaxing and spending time at home. They want a haven where they can put their feet up and read a good book. “Water is a huge issue here, with homeowners finding creative ways to conserve, such as the ‘laundry to landscape’ method of recycling greywater. 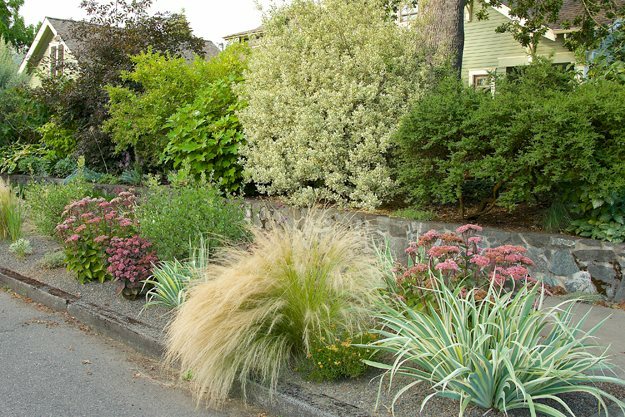 Many are taking advantage of local government rebate programs that help offset the cost of replacing traditional lawns with water-wise landscapes.